Baby College Fund Shower Theme Ideas - Can We Ask for Cash Gifts? 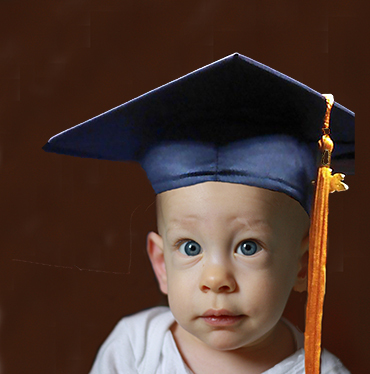 A baby college fund shower may be the best option for jumpstarting our kids' college savings account. According to experts, the minute the pregnancy test shows "positive" results is not a minute too soon to start saving. It may seem farfetched to be thinking so far ahead when the little one is in the crib and your world is revolving around diaper changes and 2 o'clock feedings but (according to my mom and dad) time has a habit of marching forward too quickly when it comes to deadlines landing on the doorstep. One day potty training is a priority and then before you can say "good job!" they will be framing their high school diploma and applying to schools with tuition prices that will have you gasping for breath and scrambling for payment options. Our girls have yet to go to grade school but I recently took current college tuition costs and divided them by the number of years we have left to save and the numbers gave me a headache; we did not start saving soon enough but better late than never. We have some advice from the experts (for the sake of our readers as well as for our own information) that not only answer my question about when should we start a baby's college saving fund but the best way to manage the savings process. Asking guests to help with education expenses may be one of the best baby shower ideas ever. We have some tips for getting the funding that you need without being accused of being rude for asking for cash gifts. There are several fundraising options that have worked for other parents to share and the answers to the most FAQ (frequently asked questions). Go here to see more decorations and centerpieces for your college fund baby shower. 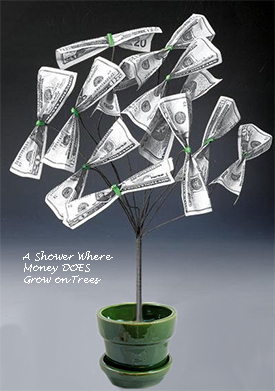 Would This be a Money Shower? Similar to a wishing well or a money shower, information on how to make donations to the baby's college fund would be included on the invitation. Instead of asking to receive gift cards to a store, the mom-to-be can ask for "a contribution to the child's future". Most of the advice offered indicates that you should start the saving process as soon as possible before time runs out and leaves you will fewer options. I was joking around when I asked should we start contributing to the fund during pregnancy..kind of. As it turns out, kicking things off when you are pregnant is not a half bad idea. Asking for money can be embarrassing and sticklers on the rules of etiquette have frowned on asking for cash in the past but with the costs of sending kids through college going through the roof (experts estimate the cost to be over $200,000 by the time our kids will be moving into their dorms) more parents are willing to risk it. Plus, there are some services that make it so simple for your loved ones to make their contribution before the baby college fund shower actually takes place if they wish. There are crowd funding websites popping up all over the web but my favorite as of the time of this article is GoFundMe because they currently have low(er) processing fees than some of the other popular sites. Visit the site of your choosing before the baby shower and create a personalized project, and then share it either by evite or in the wording of the baby shower invitation wording with friends and family as with a traditional registry. You should check to see how long the project can be kept active since you may want to request contributions on birthdays, graduations and other milestones in your little one's life. Please return to Unique Baby Gear Ideas to share your ideas for a baby college fund shower including menu items and decorations.